Ecco Golf's G3 Golf Shoes continue the BIOM story, combining traction and agility for stability, comfort and performance. Building on the success of their Biom Hybrid 3 Golf Shoe, Ecco Golf have launched a spiked version of the performance shoe with hard-wearing ECCO YAK leather uppers and a waterproof GORE-TEX® construction to keep feet dry and comfortable in even the wettest weather. 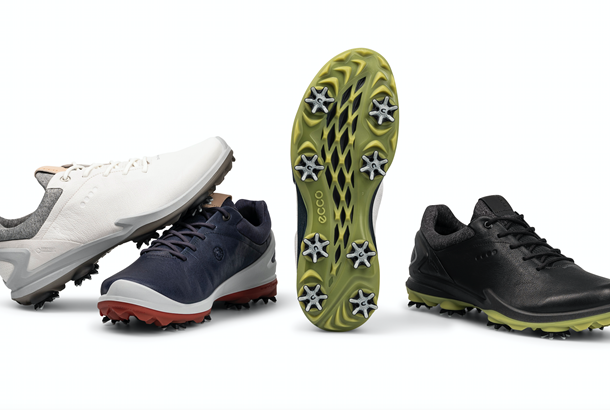 Utilising Ecco's core BIOM® NATURAL MOTION® techology, the G3 golf shoes are designed for natural motion and bring players closesr to the ground for more stability. With the addition of ZARMA-TOUR® spikes for uncompromising traction, Ecco's BIOM G3's work together with hybrid cleats on the toe and rotation line to offer optimal grip and a more stable footing right from the first tee to the last green. The uppers of the shoe are manufactured using the premium thin and tough ECCO TUMBLED TEXTURED YAK leather, from ECCO-owned tanneries, that provides a supple, garment-washed look and feel. Bouncy and full, the leather has a slightly raised grain and natural shine that highlights its eye-catching surface texture. Adding to this is a double-layer neoprene collar adds stretchable comfort and softness, adapting to the foot by seamlessly wrapping around the heel.